Human immune status is put on the stage of fetal development at the early stages of embryo development. This is useful as a undeveloped immune system can not fully protect the body from infections caused by fungi, viruses and bacteria. One of the leading roles in the functioning of this system plays a thymus gland (thymus), which is located behind the breastbone. Despite the fact that in children after birth part of organs and systems is still in a state of immaturity, thymus immediately ready to perform its functions. They are a vast array of T-lymphocytes (thymus-dependent cells of the blood) to select those that have the set of antigens that direct the human immune system against itself. During the year, the child is more than ten times colds, especially if they occur with complications. Often lymph nodes become swollen. 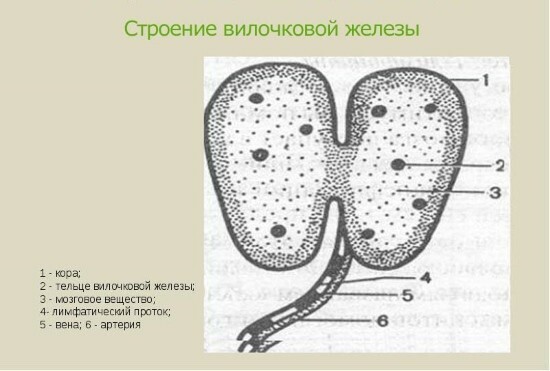 Body temperature in children for a long time kept at around 37,1-37,5⁰С (subfebrile temperature). The child is predisposed to allergic diseases – hay fever, diates, urticaria, bronchial asthma. Shortness of breath, heart rhythm disorders, the indirect signs of increased thymus. Sudden infant death, sometimes overtakes young children without any reason, according to some pediatricians is a consequence of pathology of the thymus. Symptom speaking about the problems of this body, can be thymomegaly – a significant deviation from the norm, the increase in cancer. This feature based on ultrasound of the thymus gland, and analyzing the results. Not so long ago x-rays were the only method of diagnosing pathologies of the thymus. The appearance of ultrasound diagnosis has become possible to study the thymus gland in children and adults in a more gentle manner. 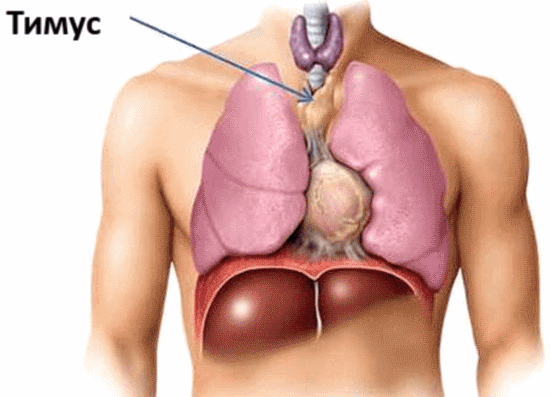 The location of the thymus, its small size requires a very sensitive instrument with high resolution. Any special preparation for an ultrasound of the thymus gland do not hold. It is advisable that the study was conducted in the standing position, when the organs of the chest slightly lowered under the action of gravity, making it easier to estimate the size of the thymus. In this position it is impossible to keep small children, so babies up to two years ultrasound performed in the sitting position or lying down. During the study, the child must not be capricious and actively move to avoid getting biased results of the study. On the sternum area cause a gel to improve conductivity, conduct an assessment of the thymus gland, calculate the degree of thymomegaly with a significant increase. For the objective evaluation you need to navigate the anthropometric data of the child to know his exact weight – the normal weight of the gland should not exceed 0.3% of total body mass. The appearance of tumors of different etiologies. Diagnosed autoimmune diseases (lupus erythematosus). Ultrasonography of the thymus is carried out by the same method as that of the children, only the criteria for assessing the extent of cancer have some differences. After 50 years, the glandular cells of the thymus is almost completely replaced by fatty tissue, and diagnose it using ultrasound is not possible. If the ultrasound showed the baby a small increase in the size of the thymus, do not worry – this is the norm for children. Sometimes this increase is due to recent colds, or infection of the mother during pregnancy. There are several degrees of timezonerule, the first and the second child can attend the educational institution, to be subjected to compulsory vaccination according to immunization schedule. If the growth of the thymus gland is significant, it is possible that more severe violations of work of organs of the child, in particular, the defeat of the adrenal glands. This condition requires urgent hospitalization, in severe cases possibly even surgical treatment. Even a slight increase of the thymus requires attention adults to doctor’s recommendations. The child needs unloading the immune system, prevention of ARI and ARI, vitamin complexes. 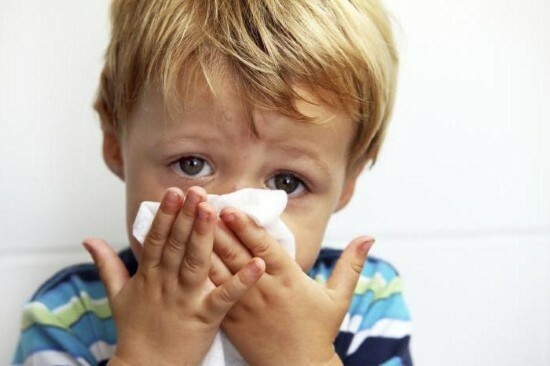 Not worth it to treat colds, give your child immunomodulators without consulting a doctor. If the time to diagnose the pathology of the thymus, after his diagnosis with modern equipment, with the assistance of a qualified specialist you can avoid a significant reduction in immunity and related diseases. How to measure intracranial pressure in adults and children?